2014 was a fantastic year for BMBW. (But it's not over yet, see below for a surprise Portland hike this weekend!) We'd like to take this time to look at some of the great things that happened this year in our program. In 2014, we worked with 56 commercial breweries to create over 60 place-based beers inspired by hikes around the country. The beers ranged from wildly experimental to subtle and elegant. For example Scratch's 105 beer was made with 105 different herbs and plants all located near their brewery, while Hopworks' beer was a tasty Berliner Weisse with the simple addition of salal berries. Or take Worthy Brewing's easy drinking ale that used wild rices, grains, and other plants from the desert and compare it to the big, bold flavors of Fremont's double IPA with elderberries, sampled next to the delicate rose hips in Naked City's Saison. Or consider Thunder Island's wild ale made with yeast from an old growth forest, which we sampled on hikes in Portland. We worked with four different organizations to help lead over fifteen regional, public hikes with brewers. Through our tasting events, we raised over $5,700 to support the educational endeavors of these organizations with your help. These organizations are: Cottonwood Institute (Denver), Forest Park Conservancy (Portland), Friends of the Cedar River Watershed (Seattle), and Oregon Natural Desert Association (Bend). Beers Made By Walking received national attention for the experimental beers that came out of our program. Some of our favorite coverage came from those who recognized that our program is an effort to connect beer to community, and to have beer reflect the landscape in an authentic and honest way. Check out articles from Seattle Weekly about our hikes in Washington, Appellation Beer talks about beer and place, and Zythophile calls us a driving force for the US place-based beer movement. We were in The Men's Journal, we were published in Outside Magazine, and we got to talk about old growth forests onOregon Public Broadcast. 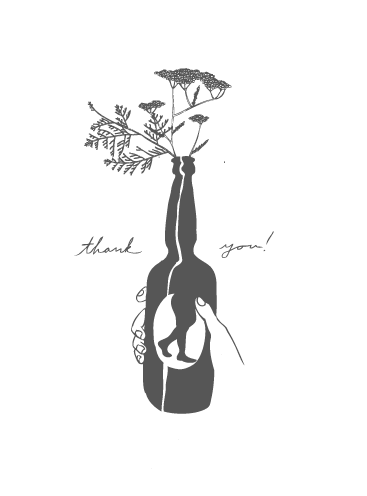 In order to continue our work to get people outside and to create beer that has a true sense of place, we need your continued help and support. Please share this newsletter with friends, tell people to follow us on Facebook, and look for opportunities to hike and give throughout 2015. That's right, we're gearing up for 2015, and we can't wait!